Oscar Jessen was a participant in The Foodprint Lab’s event, Vischan 2030, held in September 2017. After the event and spending some time on Kajodlingen’s farms, he returned to Germany to study environmental science. 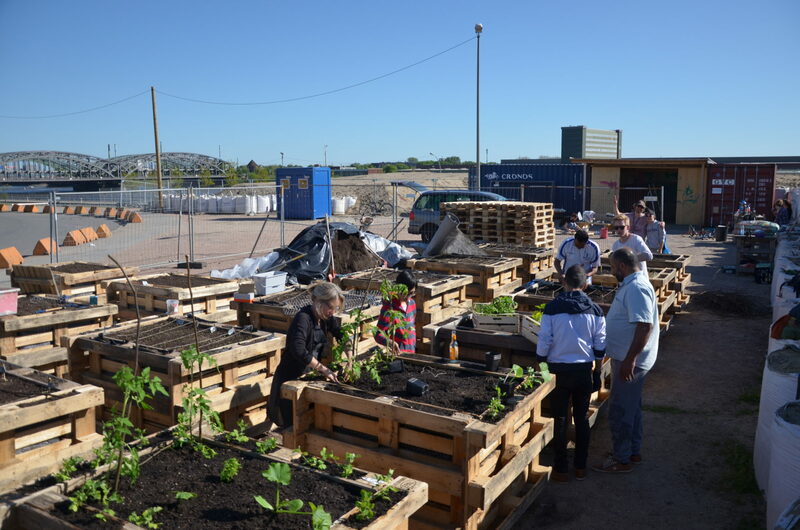 He was inspired by his experiences in Sweden and began gathering ideas on how he could transform his gained experience into an urban farming project in Hamburg. 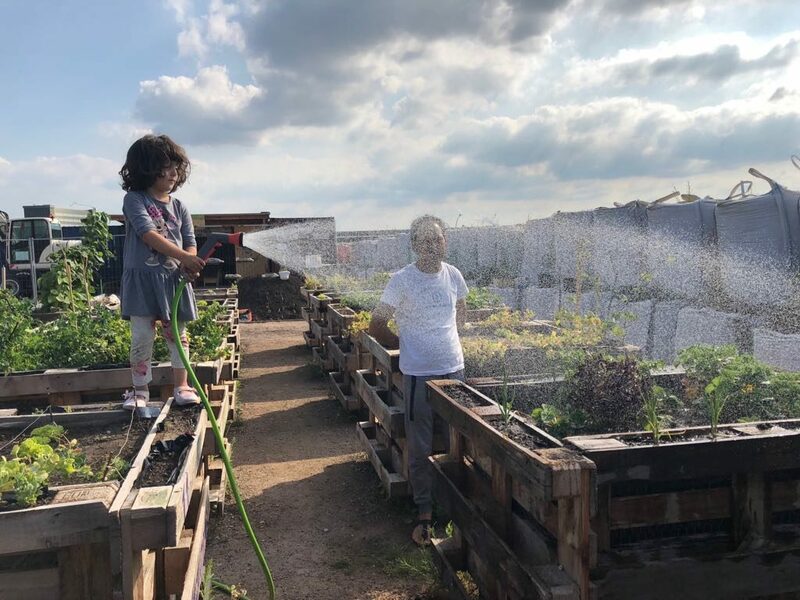 This is his story – read more to learn about his journey in setting up an urban farming project in a largely refugee residential area in Hamburg. The journey begins with an initial contact with the WAS TUN! Foundation in Hamburg. The foundation focuses on providing contributions and a platform for fundraising in a bid to preserve the liberal, democratic and constitutional values of Germany. They offered me to present my ideas and I thought that their aims to strengthen sustainable development and democratic values were in line with my ideas to open a farm. 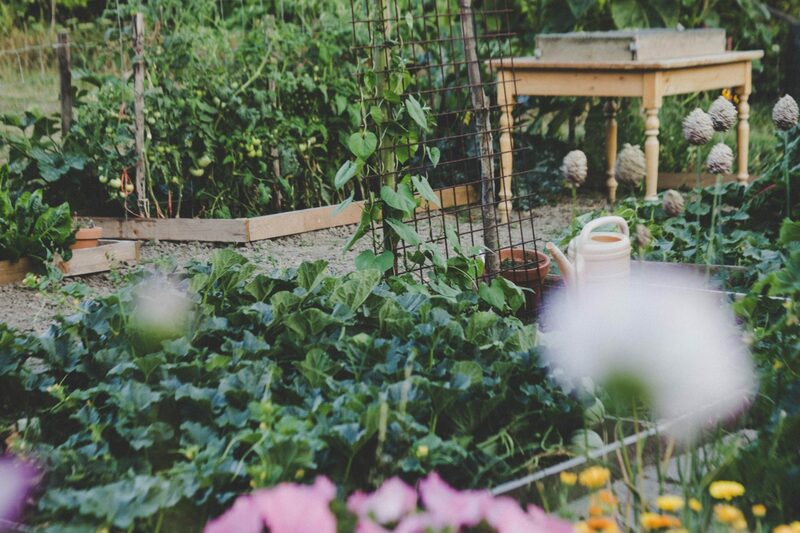 The main ideas of the project were focused on growing crops to cover our variable expenses and to enable a green platform in the city, where interested people from all cultures and ages can interact with one another and learn about growing food. We estimated that we would need about 224 m2 of farming space and that the project could finance itself, apart from the start-up costs. This initial estimation was derived from a theory coined by Curtis Stone, an urban farmer from Canada (http://theurbanfarmer.co/). In the end of December 2017, we were ready to present the main concept of our farm at a charity event of the WAS TUN! Foundation. We managed to collect about 8,900€, which was enough to finance the first year of our project – so we proceed to start looking for the right spot in Hamburg to carry out our project. Through the Foundation, the concept was shown to different stakeholders in Hamburg and we ended up having three different options. Our final choice was a location of 400 m2 in the opposite of the biggest refugee home in the Hafencity in Hamburg. This district is the newest in Hamburg, located directly on the River Elbe with great views and interesting architecture. However, it is partly still in construction, which enabled the city to build a temporary refugee home. 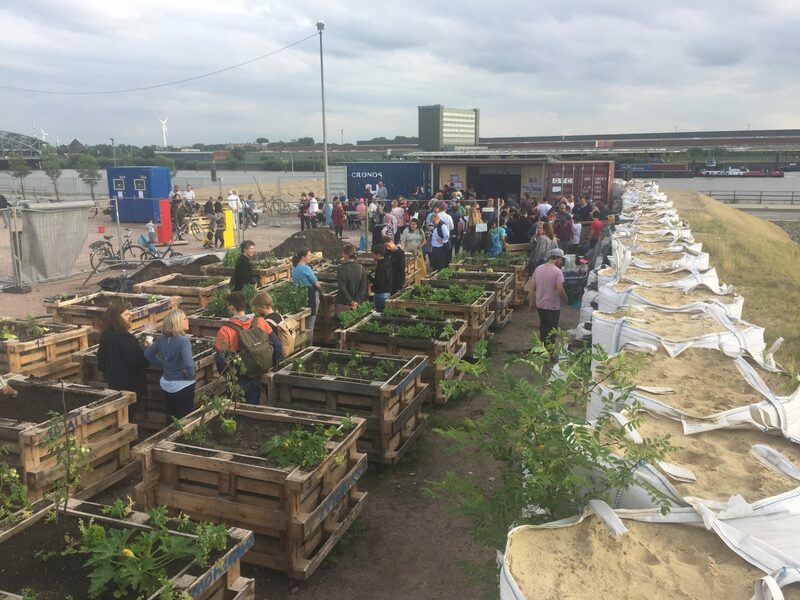 The refugee home is located at the furthest end of Hafencity, and so the isolated environment of this home, together with its 712 new residents, led us to think if it is really possible to grow food without encountering trouble or risking possible harvests. Their activities and opportunities were very limited in scope, and apart from the children going to school and the parents going to German language class, there was not much else to do. 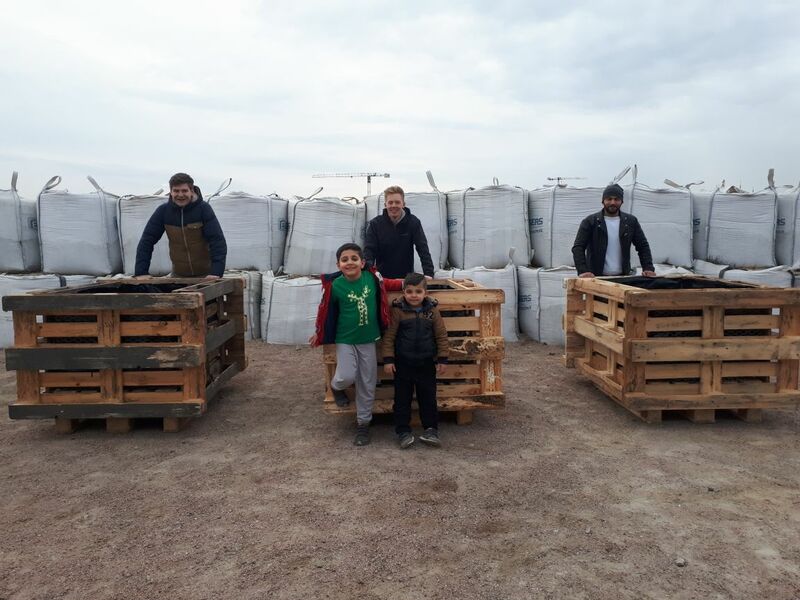 However, instead of looking for new places, we accepted the situation as a chance to create a green space in the middle of a sandy construction area and to also work with refugees. Many refugees have farming backgrounds from their originating countries and we took this as a great chance to learn from each other. Furthermore, the chances of demolition lower when you distribute responsibilities, which leads to a stronger connection to the project. We felt confident enough to handle the risks of this location and began talking to the stakeholders. With the thought of integrating grown teenagers into the project in particular, we came to an agreement with the managers of the refugee home and the real estate managers. The lease would be valid until the end of 2019 with an option for additional year, for the symbolic price of 1€. We had to build raised beds since the upper soil layer was gravel. Our project, with the ambition to sell our harvests, had also become an integration project. We defined our project’s timeline as the first year being a pilot project that will focus on gaining experience and test if it is possible to combine integration and farming. 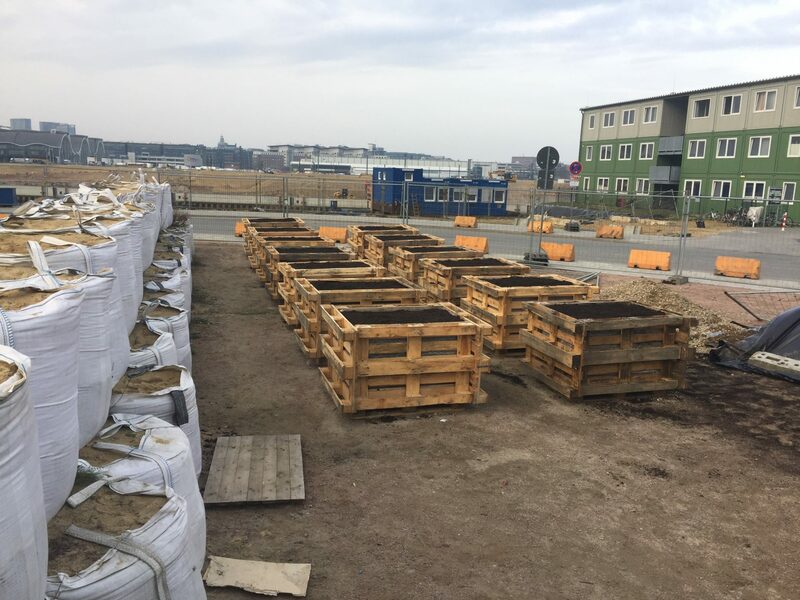 After the winter season was over, the building phase began and at the end of April, we constructed 22 raised beds made out of used wooden pallets that were filled with five layers of soil and were ready to start growing in. In the beginning, only young children were curious enough to see what we were doing. Most of them were open to helping out, and after some time, their parents started to show up as well. After the first few weeks, people from up to six different countries came to help and we organized barbecues to get to know each other. Thanks to the children, the language barrier was not very difficult to overcome and when the parents had difficulties to communicate, someone would come and aid in translating. Very quickly, a community of people was formed and they took care of watering and pulling weeds. In order to specify the tasks, every engaged refugee got the chance to take on responsibility for one raised bed. Meanwhile, the project was getting more attention from the locals of Hamburg. This started an exchange of knowledge between the locals and the refugees. Social media profiles (Facebook and Instagram) for the farm were established and with the help of fellow students, a sustainability communication campaign is still reaching out for more local volunteers. At the moment, we are counting on up to 8 locals, who took over the responsibility of the farm and the material costs for the raised beds. Apart from the successes with getting to know the people and establishing routines, the crops have been having a hard time to develop. With the new soil, and really hot and dry weather in April and May, only peas and potatoes have developed as planned. Other crops like salad or spinach have not really worked out, as well as the pre-grown plants that were donated by an ecological gardener have had difficulties to grow. Due to such, we contacted some gardeners and we changed some things in our treatment for the soil. A couple of changes are already visible. Most of the plants are now growing more consistently and the first harvests have been collected. 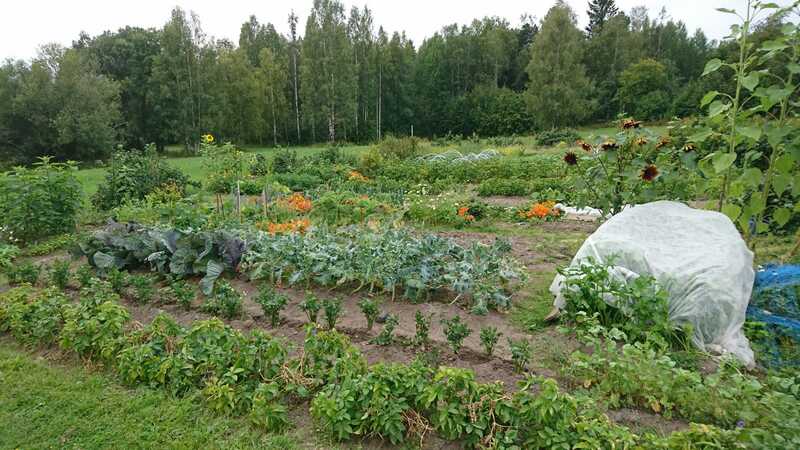 Nevertheless, we are still aware that it is hardly possible to farm on such a small space with the ambition to sell greens when you also aim to being an open integration platform. The main conclusion of the pilot year follows this insight and even though it is not possible to combine these two goals directly, we are looking forward to expand with the concept of funded green platforms in front of refugee homes. A story by Oscar Jessen. If you are interested to know more, continue to follow Oscar and his project on Instagram @ _stadtgemuese_! Do you want your growing story shared with the world? Write in to us at info@thefoodprintlab.com to connect! We’d love to hear your story!